BAYHAM: Commissioner Goodell, Deal Or No Deal? Nine years ago this weekend there was quite a spectacle snaking down Poydras Street in downtown New Orleans as a horde of burly men stumbled and stomped their way from the Louisiana Superdome to Bourbon Street in the French Quarter. What was remarkable was that these men were all wearing dresses. In fact, former Saints quarterback Bobby Hebert, riding atop a trash truck, sported a platinum blond wig and was dressed to the nines in a black and gold sequined ensemble designed by his daughter. The Saints had not won the Super Bowl. At least not just yer. No, they had EARNED the right to play in the Super Bowl. The march held on the weekend between the NFC Championship and the Super Bowl was a tribute to the late great Buddy Diliberto, who had famously declared that if the Saints were to ever reach the big game, the iconic local sports commentator would sashay down Bourbon Street in a dress. Hebert and a mob of passionate Who Dats followed through on Buddy D’s pledge. It was a truly an “only in New Orleans” moment, men in drag celebrating the unprecedented success of just getting there. I don’t think any other city in America could understand this kind of unbridled, unrequited passion for a professional sports team. Perhaps Cleveland, one of just a handful of franchises still in Super Bowl purgatory. But this weekend there was no parade in New Orleans. Nor any joy. And all the men in dresses were on the Marigny side of St. Ann Street. It was all quiet in the world’s biggest party city north of Rio. Downtown New Orleans wasn’t the only corner of quiet as the NFL Commissioner’s office has been radio silent for over a week now. During Super Bowl week no less. What’s the matter Roger Goodell? Cat (or zebra) got your tongue? Oh, I get it, Commish. Nobody would want to have to go before a live mic and have to explain not only what happened but also make the case how nine figures’ worth of American football fans who put eleven figures worth of cash into the NFL can have confidence in both you and the league. But then again, if I were getting paid $35 million annually plus bonuses, I’d learn really quick how to do that. Perhaps Commissioner Goodell is not just trying to find the words but also determining the proper and just compensation for the Saints and the city for what his employees did. Well Roger, let me help you out with the latter, if that is indeed the cause of your catatonic episode. Because Nola is due plenty. Let’s start first with draft picks. Currently the New Orleans Saints have all of one selection (second round , #62) in the first four rounds due to the front office tossing them around like Mardi Gras beads. Yeah, WWL 870’s Draft Fest is going to be a non-event this year. They might want to hire magicians or face painters. I think it would be fair if the league awarded to the Saints a first round and second round compensation picks in the 2019 NFL Draft (at the end of each round). Seems like a lot? Well, Goodell snatched the Black and Gold’s second round draft picks from the Saints in 2012 and 2013 in the aftermath of “BountyGate,” a churlish move that hampered the team’s ability to reload top-tier talent and doubtlessly played a role in the Saints not making the playoffs for three consecutive seasons. Secondly, and sticking with the draft, the NFL should park their next available selection extravaganza in New Orleans, which has ample facilities for the exclusive indoor part (Saenger or Orpheum would be outstanding venues) and the larger more fan-friendly outdoor event (just down Canal Street at Woldenberg Park). But the draft is during Jazz Fest! Well, unless the league follows lunar cycles or when Mercury is in retrograde when picking draft day, they can move the draft up a week. As we have learned, the NFL can be arbitrary like that. When it wants to. Scratch that, TWO Super Bowls within four years of each other. But New Orleans will be hosting one in 2024. So what? How many times has the NFL parked it in far less capable cities or in regions of the country with inhospitable climates in February. New Orleans should have landed last year’s Super Bowl, which would have been held during the city tricentennial, but the league handed it off to Minneapolis because they had a new shiny stadium. We would be doing the entire NFL a favor hosting Super Bowls. So there you have it Roger. 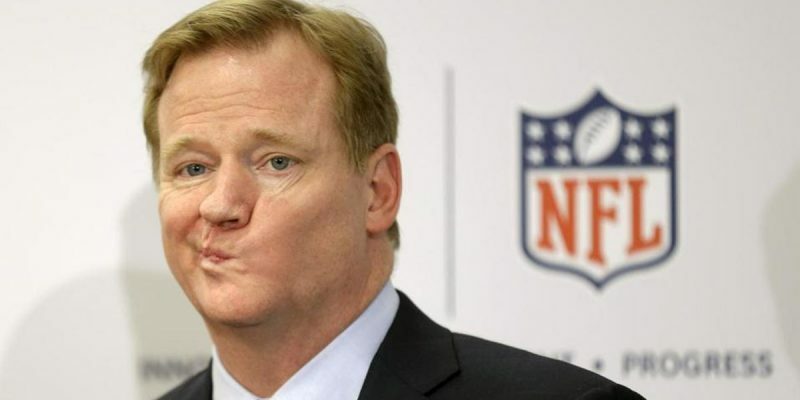 Three things that in no way could possibly restore what was taken/stolen from New Orleans by NFL referees who saw everything and chose to do nothing, but would in some marginal way attempt to make things kinda sorta right in light of how your overpaid part-time employees turned America’s game into a game show.